We agree that the market is changing, but it is easy to manipulate numbers and graphs to make an argument for or against almost anything. We looked carefully at the numbers and will present the picture as accurately as possible, from a close-up to a wide-angle view. Hopefully, this will come close to reality and will be useful to you in planning your home sales and purchases. More older homeowners choose to stay in their homes and make adjustments for limitations in their life styles. This trend temporarily reduces the number of houses for sale. Construction of new homes is minimal. Over 80% of Marin is dedicated to open space and agriculture (see Limited Housing Potential). At this time, only about 3% of the land is available for development. Demand is likely to increase in the future. The job market in the bay area, and particularly San Francisco, continues to support a large number of financially qualified buyers. The New York Times recently observed (March 7, 2019) that “Thousands of New Millionaires Are About to Eat San Francisco Alive.” Soon, The Times observes, Uber, Lyft, Slack, Postmates, Pinterest and Airbnb plan to go public, making many of their employees and stockholders wealthy. The same article cautions that young high-tech workers prefer to live simply and close to work. While they may want to stay in San Francisco and close to work, history demonstrates that having children brings the desire for better schools, homes with yards, and the open space available in Marin. As these homeowners decide to move north, the competition for Marin homes will remain high. The number of houses for sale has decreased steadily for five years. However, there was no significant slowdown in sales over the last three years, up to February 2019. The peak months ahead, April-July, will tell us more about sales. Using these metrics, there has not been a dramatic or unexpected shift in the market. In 2018, new listings peaked in April-May and again in September. Closed sales came a month later. December showed the usual drop in new listings. New listings in January and February 2019 were much lower than the year before, but sales about the same. The drop in listings in 2019 is probably due to the weather. Properties do not show well in the rain, and buyers are less motivated to shop. The last five years of home sales (see below) show seasonal fluctuations similar to 2018. However, you can see fewer homes listed each year. This is consistent with our previous reports of deceasing inventory. The number of sales in the first two months of 2019 were similar to the previous three years. Sales over the past six years (table below) shows a fluctuation up and down in the number of homes sold, with an an overall 11 % decrease. This decrease reflects the drop in the number of homes for sale. Months of Inventory is a measure of the time it takes to sell the houses that are on the market. Months of Inventory is probably the best predictor right now of a changing market. The current higher inventory indicates movement toward a balanced market, but far from a strong buyer’s market. Over the past seven years, Months of Inventory has varied from a low of about 0.9 to a high of about 2.5. 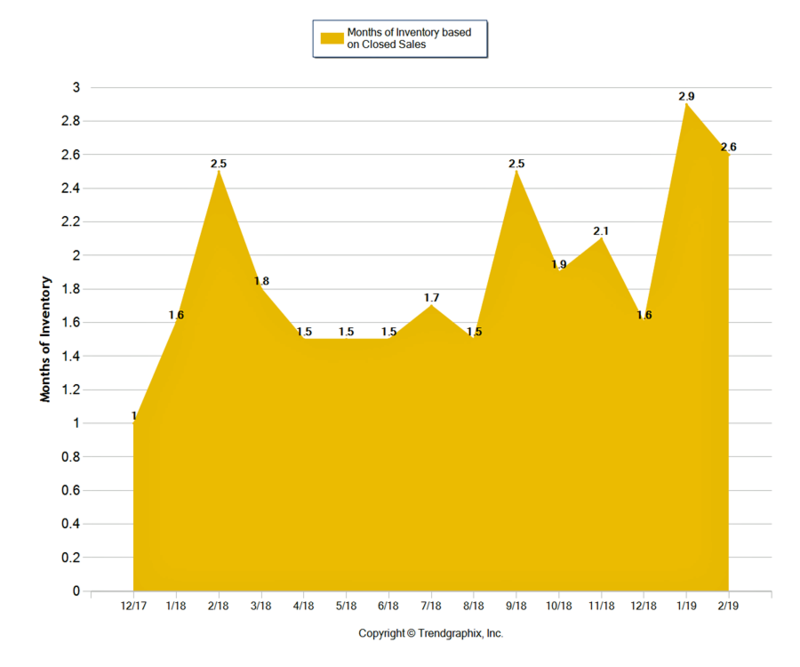 The general guideline is that Months of Invent below 3 indicates a seller’s market and above 6 indicates a buyer’s market. A value of 2.9 is unusually high, but still well below the indicator of a buyer’s market. 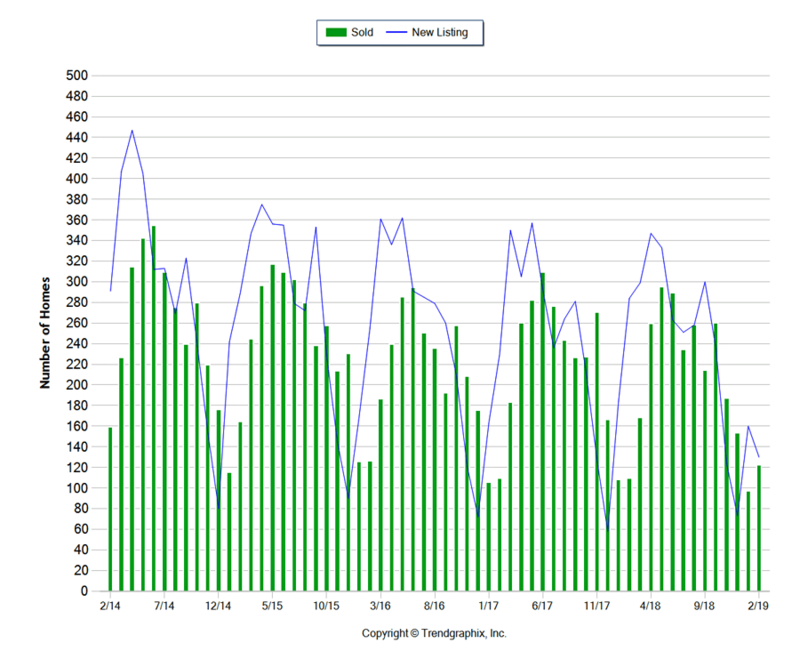 The average selling price compared to the original list price indicates buyer interest and realistic/unrealistic pricing. If selling prices is more than 100% of asking price, there were probably more multiple offers and fewer price reductions. 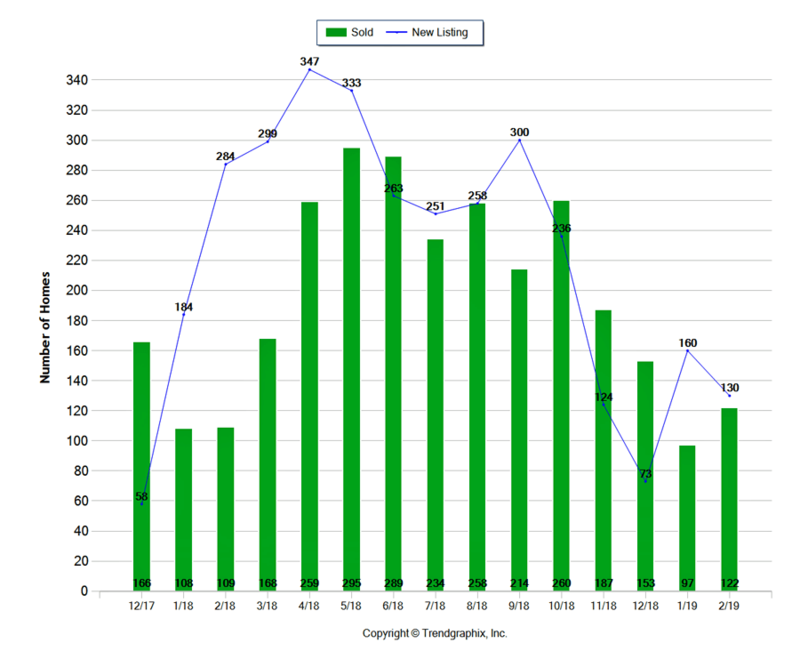 Average recent selling price compared to original list price does not show an unusual shift in buyer activity. Seasonal shifts are consistent with previous years since the real estate market recover in 2012. Selling prices compared to original list prices dropped to a low of 92% in January 2019 for homes that were listed a month or more earlier. A similar drop occurred in in January 2018 with a recovery March through June. There have been similar fluctuations for the past seven years. 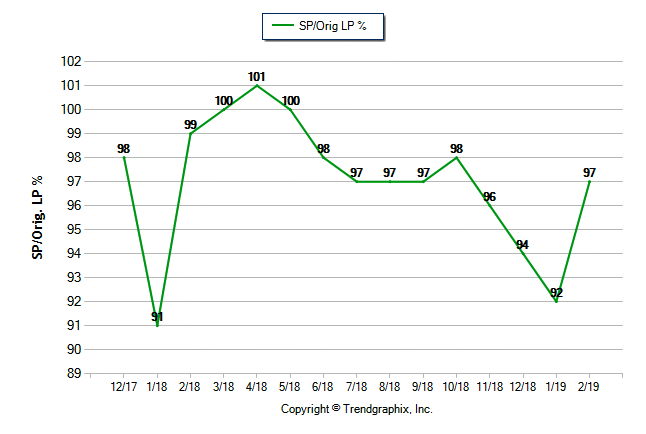 We will see if selling prices rebound to the usual 100-101% levels in the next few months. Selling prices are increasing at a significant rate, indicating continued buyer interest in Marin homes. 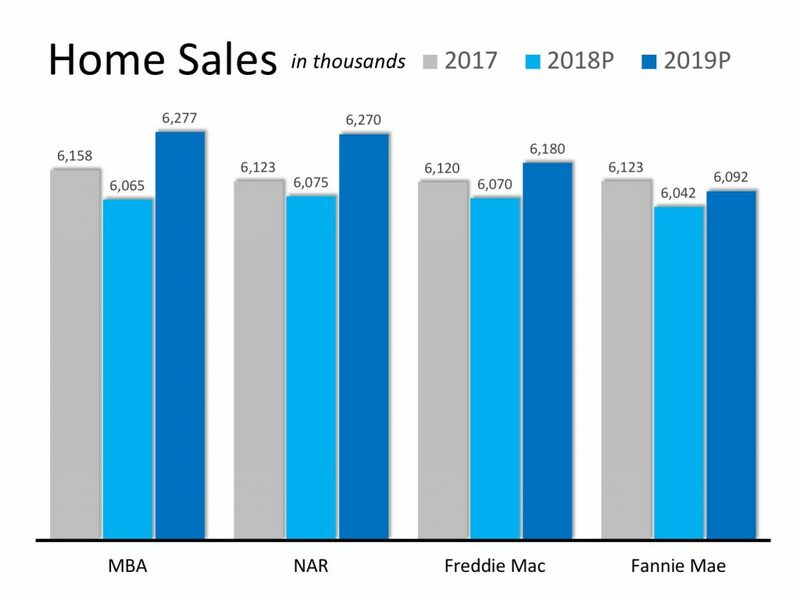 Average and median selling prices increased significantly in 2018 compared to the previous year. 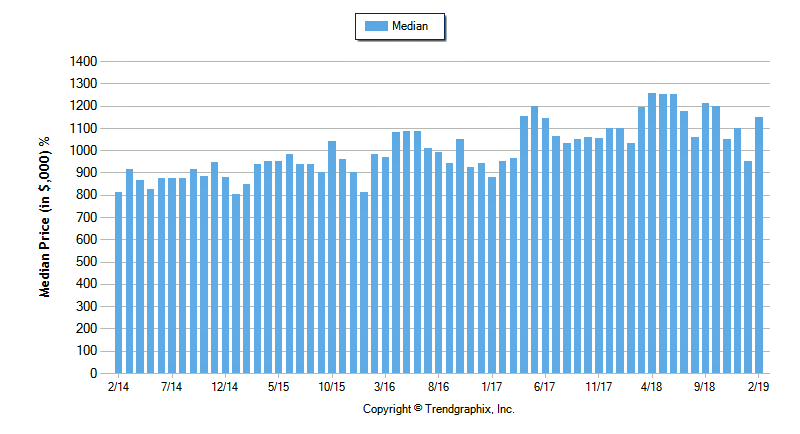 Median selling prices have increased steadily since the spring of 2013, with seasonal fluctuations. Mortgage rates effect the ability of buyers, particularly first-time buyers, to purchase homes. See our blog on interest rates and affordability. Mortgage rates are expected to rise slowly in 2019 and should not be an inhibiting factor for most buyers. According to Freddie Mac, 30 year mortgage rates dropped to a low of 3.35% in February and then increased to 4.41% in early March 2019. Freddie Mac has lowered its prediction for rates at the end of 2019, from 5.3% to 4.6%. Housing prices will continue to increase over the next year and buyers will be active, particularly in the lower- to moderately-priced market, under $2.5-3M. There may be a shift toward a balanced or buyer’s market, but indicators are not yet convincing. Inventory may increase as sellers cash out while they have a perceived advantage in the market. With better weather, we expect more listings and sales. Since 2012, the Marin real estate market has had a low inventory of homes. During this same time, historically low interest rates dramatically increased affordability for home buyers, fueling demand. The combination of these factors resulted in a prolonged, extreme Seller’s market and skyrocketing appreciation. Left unabated, these trends could result in a real estate bubble and subsequent burst like the one we experienced in 2009. In recent months these trends have begun to reverse direction, weakening the Seller’s market and moving us in the direction of a Buyer’s market. We may move into a balanced market, which is good for buyers and sellers. Key to deciding when to sell or purchase is an understanding of when this transition will take place. The following are expert predictions that will help you to make these important decisions. Home inventory in Marin is trending slightly up. The Months Supply of Inventory is the number of months it would take to sell all of the active listings at the current rate of sale. A supply less than three months indicates a strong seller’s market. Above six months, the market favors buyers. Typically, the Marin supply ranges from one to two months. From August through October 2017, the average supply was 1.87 months. In 2018, it rose to 2.1 for a 12.3% Year-to-Year increase. More inventory means less competition for a listing. This puts buyers in a better bargaining position than they have been in for the past few years. It also will make it easier to locate and obtain their first home choice. The nation-wide real estate crisis from 2009 until 2012 resulted in high home inventory, shown here, and lower median sale prices (blue line). 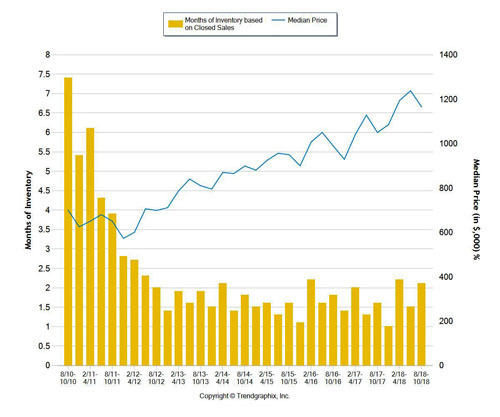 Since the start of 2012, inventory has been low and prices increasing. 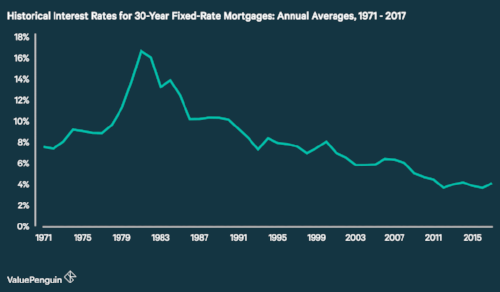 After reaching a high of nearly 19% in 1981, mortgage rates have steadily declined and remained low since the 1990’s. Since the housing crisis in 2008, rates have consistently stayed under 6%, with the rate on 30-year fixed-rate mortgages bottoming out at 3.31% in 2012 and 3.41% in 2016. Today, November 2018, the best rates for 30 year fixed rate mortgages are about 4.5%. Projected increases are small, and rates will remain relatively low through 2019. These projections for 30-year-fixed-rate loans are from Freddie Mac, Fannie Mae, the Mortgage Banking Association, and the National Association of Realtors. They all agree that interest rates are on the rise and should reach about 5% by the end of 2019. These projected rates of appreciation have been compiled from a number of industry experts, including the Pulsenomics Home Price Appreciation Survey (HPES), a survey of over 100 economists, investment strategists, and housing market analysts. Averaging all projections, home appreciation is expected to slow from 5.6% in 2018 to 2.9% in 2022. That is a 48% decrease in the rate at which home values increase. These are national averages. While the Marin County numbers will will vary from the national figures, and from one town to the next, the trend will be similar. For the first 10 months of 2018, the average sold price for Marin County homes increased by 6%, compared to the same time period in 2017. The median price increased by 10%. Incomes are up. Even with rising interest rates, mortgage payments as a percentage of income are down. The economy is healthy. Real estate sales volume generally follows the trend in consumer confidence which is on the rise. Home equity is up which will motivate more sellers to sell and buy up. There are indications that a transition from a seller’s to a buyer’s market has begun. How long it will take for the buyer’s market to make a significant impact at the negotiating table is hard to say. There are numerous domestic and global issues that could affect the rate of transition. Expect the shift to be gradual as inventories increase and increasing interest rates reduce demand. With the low inventory of houses and high demand, caused primarily by low interest rates, sellers have had a significant advantage in negotiations for the past seven years. Homes have been selling very quickly, often before even coming on the market, and often with multiple competing offers. It has been common for sales prices to be well above the list price with other terms also beneficial to the sellers. We have already seen indications of a weakening seller’s market – more price reductions and longer marketing times before offers are written. Anyone thinking of selling in the near future should consider this trend. If the predictions are correct, the seller advantage will weaken over time. Interest rates are predicted to continue to rise, though gradually. And the higher they go, the less home you will be able to obtain for the money. Some buyers believe that they should wait until prices come down. According to my research, however, that is very unlikely to occur. As demonstrated above, most experts see the rate of price appreciation slowing down, but I have found nothing to support a theory that they will come down. Some buyers have become discouraged, giving up their dream of home ownership after writing offer after offer only to be overbid each time. Increasing inventory means that there will be less competition per listing. So these buyers who gave up might want to get back in the game – especially while interest rates are still historically low.